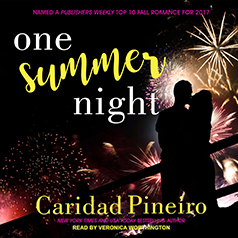 Caridad Pineiro presents the first novel in the At the Shore series. Everyone knows about the bad blood between the Pierces and Sinclairs. Their families are supposed to hate each other, but Owen has been watching Maggie from afar for years. Whenever he can get down to the shore, he strolls the sand hoping for a chance meeting—and a repeat of the forbidden kiss they shared one fateful summer night.